Would there be a Lowell Inn in Stillwater without Nelle Palmer? Likely not. She became the face and personality of the inn, saw it through the Great Depression and World War II, and took it upon herself to provide the best possible experience for everyone who visited. Before she was even old enough to attend school, Nelle Obrecht and her siblings were part of a theater troupe that traveled throughout the midwest. Performing mainly musicals and often accompanied by their parents, the children were considered musical prodigies by their fans. By the late-1920s, Nelle was 34 years old and had been in show business for 30 years. Her specialty was melodrama and she was known to have a flair for the dramatic, on and off the stage. Her strong personality would serve her well and lead her to extraordinary success. In 1927, Nelle married musical director Arthur Palmer and the two formed their own theater troupe that played theaters from Broadway to Minneapolis. The invention of moving pictures made their elaborate stage productions less desirable to the general public, so by the end of the 1920s the two began looking for a new career path. Meanwhile, the Lowell Inn in Stillwater was having trouble finding its feet. Barely three years old at the time, the 50-room inn hadn’t been able to turn a profit. Not one to turn her back on a challenge, Nelle agreed to join Arthur in Stillwater as the couple became the latest in a long line of managers at the Lowell Inn. When Nelle and Arthur arrived in Stillwater in 1930, Nelle was described as a cross between Marlene Dietrich and Lillian Russell. She loved to wear huge, veiled hats and relished any opportunity that would put her in a position to be seen as an inspiration to the townspeople. She soon became known as the town's matriarch and ruled the Lowell Inn. It paid off--the Lowell Inn finally turned a profit and began growing a reputation for comfort and elegance. The Palmers purchased the inn in 1945 and set about making it a memorable place for visitors and locals alike. Bit by bit, the Palmers created a Minnesota institution, nationally acclaimed for its accommodations and fine cuisine. When Arthur died in 1951, Nelle grieved inconsolably. Their son, Arthur Jr. ran the inn by himself for nearly three years as Nelle recovered from losing her beloved husband. Arthur Jr. and his wife, Maureen, ran the inn for many years after Nelle died of cancer in December 1970. 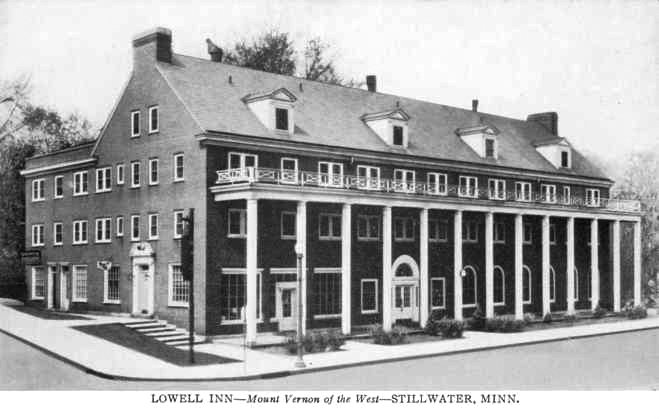 The Lowell Inn is located at 102 2nd Street N, Stillwater, MN 55082. A day in advance, place the first 11 ingredients in a large saucepan. Add water to cover and cook over low heat for half an hour. Drain the fruit and reserve the liquid. Stir the yeast into the prune juice and let stand in a warm place (75°, ideally) for five to seven minutes. Meanwhile, place ¼ cup of the warm liquid reserved from the fruits in a large mixing bowl. Add the butter, stirring to melt. Add the yeast mixture, sugar, salt, brandy, and two cups of the flour. Beat well to mix. Continuing to beat hard, add the remaining flour one cup at a time, until the dough forms a ball and sides of the bowl are clean. On a lightly floured surface, knead the dough until elastic, about seven to 10 minutes. Roll dough into a rectangle the length of a bread loaf pan. Roll up the width, jellyroll style, to form a loaf shape. Place the dough in a bread loaf pan and cover tightly with plastic wrap. Refrigerate overnight. Remove pan from refrigerator, recover loosely with plastic wrap, and allow to rise for two hours in a warm place. Bake in an oven preheated to 300° for one hour. Remove when done and place on a rack to cool. After 10 minutes, remove from pan and allow to cool completely.